As I said in an earlier post, I’ve started to get into modeling mainly as a spinoff of my miniatures wargaming habit. Well, that habit continues, and every now and again I have an opportunity to play a wargame or two – thanks to a very patient wife (wargaming opponents have been hard to come by here in Khabarovsk). We recently tested out a new set of rules, called “I Ain’t Been Shot, Mum!” Lots of fun. Here’s the after-action report. For the test scenario, we ran a simple hypothetical meeting engagement with two platoons of German Infantry with light mortar support against two platoons of Soviet Infantry with HMG support. The overarching objective for both sides was control of the bridges in the town. IABSM uses some interesting mechanisms, which add to the unpredictability of the game, and I think add to the interest as well. Firstly, it uses a system of blind movement, whereby units are represented by “blinds,” until those units are spotted or open fire. A blind may be an actual unit (platoon, in this case), or it may be a small recon squad of a few men (basically a “dummy” blind – no combat potential, but able to spot and move). This means you don’t really know what you’re facing, sometimes until you’re right on top of a unit (like in real warfare). 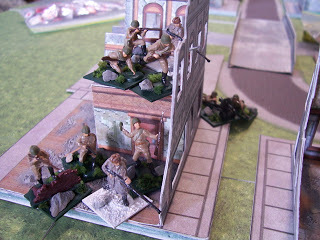 In this photo, the Russians advance on the town, using the cover of the buildings and forest to advance practically unnoticed. The dice are used for movement, firing, and spotting, and as your unit loses men, it loses dice, thus reducing it’s effectiveness. Here, a German platoon with light artillery support is revealed early on, as they advance in the open. Each squad can then move on it’s own, but usually with reduced effectiveness. Blinds receive four initiative dice, but each regular Wermacht squad receives only three. Nte that the squads are represented by four figures for ease of play, and due to the lack of figures in sufficient numbers, especially on the Soviet side. Need to do some more painting! The Germans advance on the town. The dice next to the unit are it’s reserved dice, which can be used for firing or spotting at any point in the turn. Here a Soviet platoon takes cover in a ruined building. Note the Maxim HMG in support. The AT rifles are actually substituting for light MGs – again, need to do some more painting – I only had enough LMGs for one platoon! Another interesting feature of IABSM is the use of a card-based initiative system. Cards representing every unit (as well as some special characteristic cards) are placed in a deck and shuffled. Then they are turned over one at a time, to indicate when those units are activated. There is also a “Tea Break” card, which indicates the end of a turn, when all unit cards are reshuffled. What this means is that unit order is not fixed, and it is possible (even likely) that not every unit will activate every turn! In fact, this HMG unit, after taking up it’s position in the building, never once activated the entire game! Obviously new recruits lacking appropriate supervision. Here we see the deleterious effects of combat. This German platoon has made it to the bridge – but it was unfortunately as far as they ever got. They tried to advance in the open and received withering fire from the Soviets behind hard cover in the buildings of the town. The white counters represent “wounds,” which reduce the squads’ effectiveness. The black counters represent actual casualties. One more casualty on this squad on the foreground, and they will be down to one figure, or zero initiative dice (I used the number of figures to represent how many dice the squad had +1, since even if a squad has no dice, it still has the potential of action, albeit this action more often than not would be to seek out cover – which the two squads with attached platoon leader in the background have already done). RUMBLE! Close assault usually proves devastating and decisive, and this was no exception. The assault ended with the two squads of Germans in full retreat. This left the Germans with a squad with Platoon commander in the church, and the second platoon taking cover by the bridge on their left flank. However, they had by this point sustained too many casualties to offer effective resistance, and left the field of battle, regrouping for a counterattack on another day. Overall, the game was really fun, and while it was unpredictable, this added to the “feel” of the game. The ranges in this game seem rather “short,” meaning lots of ineffective fire until you really get close. Artillery was a mixed bag. In this game, there was no forward observer, but IABSM allows for “blind firing” of light and medium on-table artillery. What happened was the German mortars ended up sitting way back on the table without line of sight to anything, and just fired off of map coordinates. Usually, the fire scattered, but occasionally it was dead on, and there didn’t seem to be any difference in accuracy if the mortar unit could see the impact point or not – perhaps I’m reading the rules wrong, and if so, feel free to correct me. This was a bit of a sticking point for me, but all in all, the mortars did not have an overwhelming effect on the game. Overall, the rules are worth a look-see. Check them out at www.toofatlardies.co.uk.